Cuban-American soprano Elizabeth Caballero has received glowing reviews for her opening night performance as Mimì in La Bohème, from both critics and audiences. She sings again in tonight’s performance, so we thought it’d be the perfect time to catch up with her and learn more about her and what she thinks of this wonderful Puccini opera. For more information on La Bohème, including tickets, visit seattleopera.org/laboheme. Elizabeth Caballero sings the Wednesday/Saturday performances of Bohème and alternates in the role of Mimì with Jennifer Black, who sings Sunday/Friday performances. Welcome back to Seattle, Elizabeth! First, tell us a little about your background; we hear you have an fascinating story about moving from Cuba to Miami when you were a child. I came to the USA when I was a child, during the 1980 Mariel Boatlift, along with my parents and sister. If you are not familiar what that part of our history, it’s when Cuba and the USA agreed that anyone who wanted to leave Cuba could—if they had family members already living in the U.S. who could come get them by boat. It was an exodus that lasted from April to September of that year, with more than 125,000 Cubans fleeing the island. Luckily for my family, my aunt was already living in the U.S. and claimed us. The thing the Cuban government did not tell the U.S. was that, while people were being picked up by their family members, Cuba would be emptying out its jails and mental hospitals—basically to get rid of the “undesirables.” It’s really terrible when you think about it, and it must have been very difficult for my young parents to deal with all of this with two little girls. That they left everything behind and began a new life in a new country...I will be eternally grateful to them and my aunt. Today, I am who I am because of their sacrifices, and because I grew up in a free country. 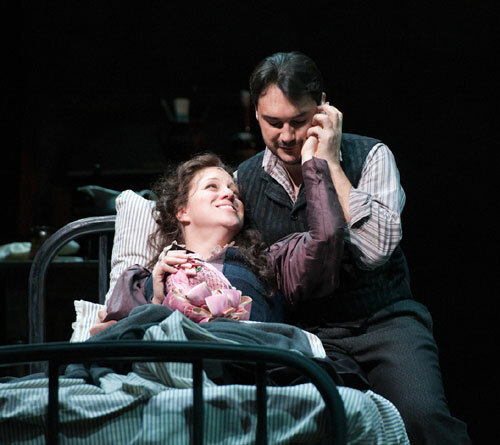 Elizabeth Caballero (Mimì) and Francesco Demuro (Rodolfo) in Seattle Opera's current production of La Bohème. We’ve chatted with you quite a bit on Twitter, and you seem to be one of the rare opera singers who is an active tweeter! What do you like about that platform? We live in a world today that is driven by social media, and Twitter is a great tool for that. I get to share with my family and friends behind-the-scenes moments through pictures and updates on my comings and goings. We get to chat back and forth and, at the same time, I make new fans. I also have a Facebook page where I post a lot, too, but Twitter has been more fun lately. If you’d like to get in touch, my Twitter name is @LizCaballero, and my Facebook page is facebook.com/ElizabethCaballeroSoprano. 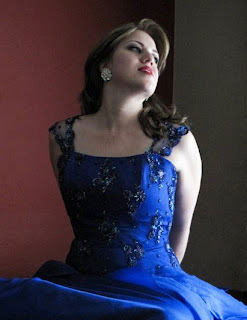 Below, hear Elizabeth Caballero sing a phrase from "Donde lieta," the aria in which Mimì breaks up with her beloved Rodolfo but tells him to keep the pink bonnet he bought her, to remember her love. Carlo Montanaro conducts the orchestra of Seattle Opera. Do you get many tweets from fans? And have you convinced any of the non-tweeters in this cast to get on board? I do get lots of tweets from fans across the world. It’s really exciting. And yes, while here I got Michael Fabiano to be more active on Twitter, and Jenna [Jennifer Black] to join. I met Maestro Montanaro on Twitter before I met him here in Seattle. I found him and we started tweeting. It’s a really cool way to stay in touch with colleagues, too. So, La Bohème is an opera every opera fan has experienced, and probably many more times than once. Why do you think it never seems to get old? La Bohème is basically a love story with beautiful music, and the characters in the story are people who are very easy to relate with: four poor, starving, and cold student-like guys, living life to the fullest. I’m sure we’ve all been there. Yes, it’s a story with a sad ending, but at the same time I believe La Bohème is a story that reminds of us young love (and, sadly, young death). It’s very relatable in the sense that everything can be perfect, and then boom! Something happens, life happens. La Bohème is a story of real life set to the amazing music of one of opera’s most wonderful composers. In my opinion, it’s a perfect combination. 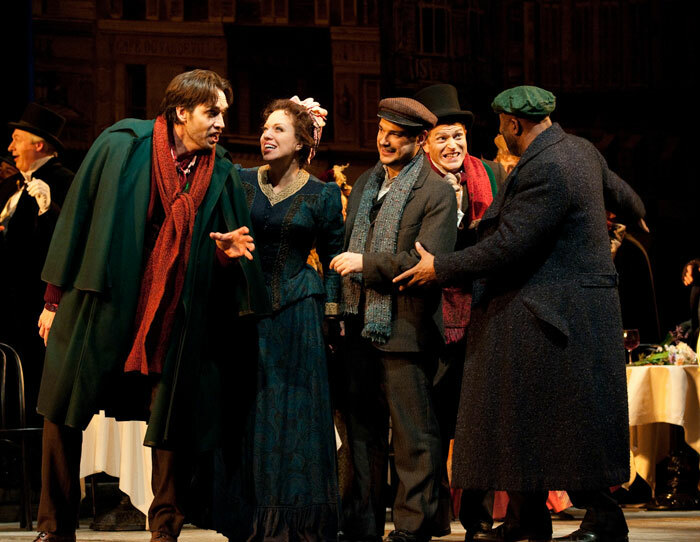 Michael Todd Simpson (Marcello), Elizabeth Caballero (Mimì), Francesco Demuro (Rodolfo), Andrew Garland (Schaunard), and Arthur Woodley (Colline) in Seattle Opera's current production of La Bohème. You mentioned the lively characters in this opera, and it’s true: La Bohème is a great ensemble opera. Have you worked with members of this cast before? I have worked with Michael Todd Simpson (Marcello) before. I was his Donna Elvira to his first Don Giovanni. It was a great show, and a big success for him. I'm happy to hear he's sung a few more Dons after that one. I've also worked before with Arthur Woodley (Colline). He was Bartolo in Le nozze di Figaro when I was last here in Seattle. It's so nice to sing with him again—such a fine man and a beautiful singer. I sang my first Traviata with Michael Fabiano (the Sunday/Friday Rodolfo) a few years ago. Although I don't get to sing with him this time around, it's always such a joy to hear him. Jennifer Black is his Mimì, and we go way back. We were in the Merola Opera Program together several years ago, and we trained together in the summer program for the San Francisco Opera. We actually sang La Bohème together: I sang my first Mimì while she sang her first Musetta. It's been so wonderful to hear her again. While we don't share the stage together this time around, I feel lucky to hear her beautiful Mimì. I worked with Tomer Zvulun, our director, at the Met and I've loved working with him again. He's very smart, witty, patient, and knows how to get the job done. As for my other colleagues in this cast, I've never worked with them before; I just know of them or have heard them in other shows. But it's been a true joy bringing this Bohème to life with each and every one of them. 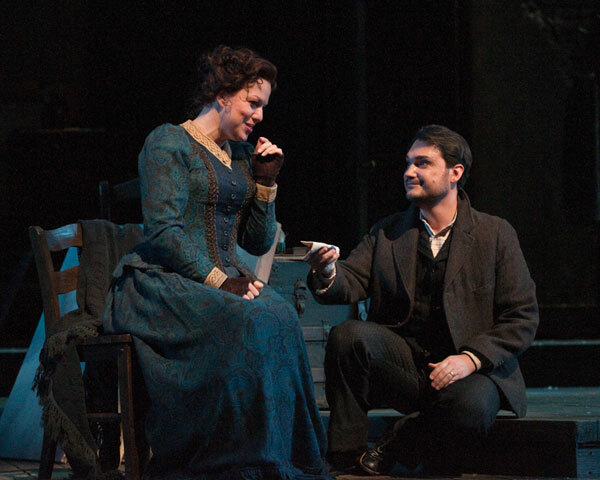 Do you have a favorite moment in La Bohème? My favorite act to sing and watch is Act 3. I love singing the duet with Marcello, and then the aria to Rodolfo, followed by a perfect duet that turns into a quartet and back to a duet. It's funny because I've also performed many Musettas, so during that quartet I have to stay very focused on Mimì because it is very easy to want to sing Musetta's lines in the quartet! Especially because she's arguing with Marcello there and it's very hot and flashy. While I love to sing Mimì, Musetta is a lot of fun and I love that I can sing both girls. What’s next for you, once you leave Seattle? I have lots of “firsts” coming up for me. After Seattle, I go to Madison Opera to sing my first Donna Anna in Don Giovanni. I’ve sung many Don Elviras, but this will be my first crack at Anna. I later go to Santo Domingo to sing a Spanish version of The Merry Widow—or La Viuda Alegre in Spanish. I love to sing in Spanish, since it’s my first language, and this will be my first Widow. Soon after that, I go to Virginia Opera to sing my first Alice in Falstaff, I have a Traviata at Florentine Opera, and then I go to Rio di Janeiro to sing my first Anna Trulove in The Rake’s Progress. I finish next season with my first Carmina Burana and Nedda in Pagliacci as a double-bill at Hawaii Opera Theater. I’ve sung Nedda before, but I’ve never been to Hawaii, so I’m really looking forward to it. So, yeah, I’ve got my work cut out for me, finishing off this season and next! New Best Selling Music Promotion Book on Amazon! This book is perfect for musicians, independent artists and music producers who want to know how to take their career to the next level! Share with any musician you know.